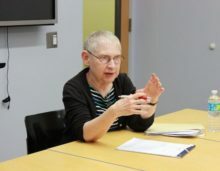 On October 28, 2016, the Jordan Center for the Advanced Study of Russia at NYU welcomed Diana Greene, a Slavic Studies librarian at NYU, for a colloquium on “Nineteenth-Century Russian Women’s Novels: Questions, Thoughts, and Speculations.” Greene, who presented a draft of the introduction to her forthcoming book on the same topic, was introduced by Ilya Kliger, Associate Professor of Russian and Slavic Studies at NYU. Greene, a Russian literary scholar, said that her project began with a question: Why are there no canonical 19th-century Russian women novelists? This inquiry gave rise to several others: Why focus on the novel in particular? Are there, in fact, Russian women novelists, now forgotten, who are good and are worth reevaluating or recovering? What does it mean to say a novelist or novel is good? Do interpretive strategies exist that would make 19th-century Russian women’s novels legible and readable to 21st-century readers? What is a novel? Is there a woman’s novel? A man’s novel? A Russian novel? “It has become clear that in order to answer my original question, I must address all these other questions as well,” Greene said. Greene’s previous book, Reinventing Romantic Poetry: Russian Women Poets Of The Mid-Nineteenth Century, contended that Russian women romantic poets had to reinvent male-defined poetic conventions, genres and themes in order to write their poetry. “It occurred to me that perhaps Russian women novelists […] likewise may have had to reformulate male-defined novelistic conventions in order to write their novels—that their novels may have been dismissed by the literary establishment not because they weren’t good, but because they were different,” she said. Greene said that she narrowed the frame of her book to literature published between 1830 and 1880, but had yet to decide which authors and novels to write about. In her preliminary research, she found over 60 Russian women novelists who published during this time. Greene said that she is thinking of focusing on four novelists who encapsulate the five-decade period. She will also take an interdisciplinary approach to analyzing the literature. Considering different literary strategies that might make 19th-century Russian women’s novels more accessible to 21st-century readers, Greene mentioned the double standard. “Why, for example, is [Mikhail] Lermontov’s Geroi nashego vremeni included in every study of 19th-century classic Russian novels, while [Maria] Zhukova’s Vechera na Karpovke is not?” she asked. Fundamentally, Greene’s project will use gender as a category of analysis and as a basis for signifying relationships of power. Women’s writing has often been simplified to a “marriage plot,” but whereas men’s literature commonly tells stories of adventure, enterprise and conquest, women attempted to make sense of their surrounding world, Greene explained. A few trends also populate women’s novels, like double address and double voicing, which potentially connects to the idea of women as a “muted group” in male-dominated society. “Every woman has written for men,” Greene said, speculating that double voicing might function similarly to W.E.B. Du Bois’ concept of double consciousness for the African American community in the United States. In the Q&A session that followed, audience members asked Greene how she would address genre and the societal limitations of female writers in her ongoing project. NYU Russian and Slavic Studies Department Chair Anne Lounsbery questioned whether Greene would only study novels that authors had themselves labeled as roman. Nikolai Gogol, she added, never called Dead Souls a novel, but it is nevertheless incorporated into the Russian literary canon. Said Greene, “I think authors get to say what they’re doing to define what they’ve done. To label someone’s work in a different genre isn’t fair.” Kliger pushed back, mentioning that ironic misnomination is common in the literary field—“Authors often do not want to be clear about what they’re doing, they want to be playful,” he said. Some members of the audience advised Greene to consider the reception and the publication process of women’s novels. “The status of the author is being negotiated most visibly in the preface and paratextual platforms,” said Assistant Professor of Russian and Slavic Studies Rossen Djagalov, adding that in 19th-century American women’s literature, it was a common practice for a male writer to preface the book, explaining that the author was, in fact, a woman, but a literate one.